Peter, a Milwaukee native, was in the music business for 12 years in Los Angeles. During that time he frequented and ate at a sushi bar across the street from his residence. He made friends with the chef who wanted to open up a brand new restaurant. Tired of the music scene in 1980 and looking for something to do, Peter joined forces with the chef and opened a restaurant, Hama ("beach" in Japanese), in Venice Beach - that began Pete's culinary career. He met his wife, also a Milwaukee native, in California and decided that they should raise their children in Milwaukee. He opened a Hama restaurant on the shores of Lake Michigan thereby continuing the "beach" theme. Peter had a dozen friends who lived in the North Fork Valley for 30 years - and he always wanted to relocate here at some point. He finally got the opportunity to move to the Valley in 2012. And in December, he opened PJ's Pub. 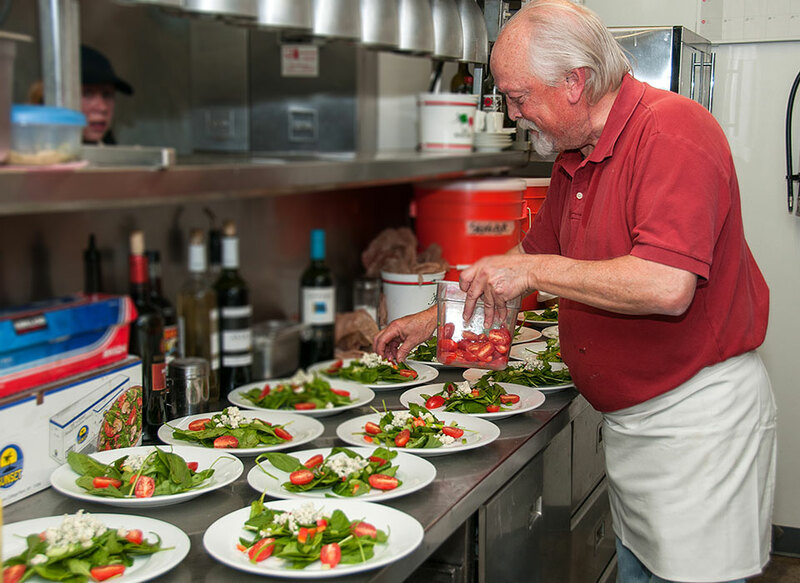 He describes his cuisine as "eclectic - something for everyone"!